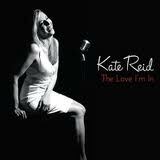 Kate Reid is a working jazz singer and pianist appearing regularly with her quartet at jazz venues all over the Los Angeles area including Steamers Caf? and Jazz Club, Vitello?s, The Jazz Bakery, The Lighthouse, Sangria, and Betty Hoover?s Jazz at the A Frame. She has worked with many of the great jazz musicians in Los Angeles including guitarists Ron Eschete and Larry Koonse and drummer Roy McCurdy to name just a few. She is in demand by audiences for her swing style and delivery of great jazz standard lyrics. Kate?s latest CD ?The Love I?m In? was released in September of 2011 and features tenor saxophonist Ernie Watts and pianist Otmaro Ruiz. Like her 2008 release, ?Sentimental Mood?, ?The Love I?m In? includes tunes from the American songbook. Kate has also sung and appeared with many noted artists including Jon Hendricks, Grady Tate, Joe Williams, Maynard Ferguson, Rosemary Clooney, Mercer Ellington, Della Reese, Don Shelton, Lionel Hampton, Mark Murphy, Kevin Mahogany, Paul Anka, Liza Minelli, Tito Puente and the Duke Ellington Orchestra. Kate is a working session singer in L.A. Her film credits include ?Land of the Lost? (2009) and ?Tooth Fairy? (2010), ?John Carter? (release date in 2012), ?Iris? (2011 Cirque de Soleil), and ?The Lomax? (release date in 2012). Other recent recording work includes demos for Hal Leonard Publishing, commercial spots for T-Mobile and Suntory Whiskey. Kate has also sung backing vocals for artists X Japan and Josh Groban. She has extensive experience in group singing and recording. She has recorded many broadway and musical theater style shows for Royal Caribbean and Costa Cruise Lines. She also lent her voice to the Orange Bowl half time and parade shows in the mid 90s and was selected as one of four back-up vocalists for the recorded and nationally televised Summit of the Americas broadcast produced by Quincy Jones in 1996. Dr. Kate Reid is on the music faculty at Cypress College in Cypress, California and currently serves as chair of the music department as well as head of the applied music and jazz programs. She teaches the jazz vocal ensembles, music history and maintains a private voice studio at the college. In April of 2011, Hal Leonard published the vocal method book ?How To Get The GLEE Sound? which Kate co-authored with producer/author Andy Waterman of Umbrella Media. Kate holds a B.M. in Jazz Studies from Western Michigan University (1992), a M.M. (1996) and a D.M.A. (2002) in Jazz Performance from the University of Miami.